Joey Andrews, Arkadelphia School District, USA "DNSBOX was easy to deploy – it didn’t require much training to get started. The ApplianSys support engineers guiding us understood our technical requirements well – we were assured that we were in good hands." Nokia Siemens Networks (NSN), USA "CACHEBOX works to maximise the bandwidth that schools get. So it's like getting extra bandwidth at no extra cost." Alex Tin, Belmont Charter School, USA "Our bandwidth problems have been practically eliminated. Monitoring & customization is a snap with the web interface." EDUGATEBOX is an all-in-one network appliance designed to get schools online easily, safely and at best value. With EDUGATEBOX, education authorities can roll out cost-effective classroom internet and e-Learning anywhere, however remote – and give their students the chance to leapfrog a digital generation, even where bandwidth is a problem. From its simple intuitive interface any school can run a full service network, allowing devices to safely connect to the network and access the internet, without having to understand the complexities of each on-board function. 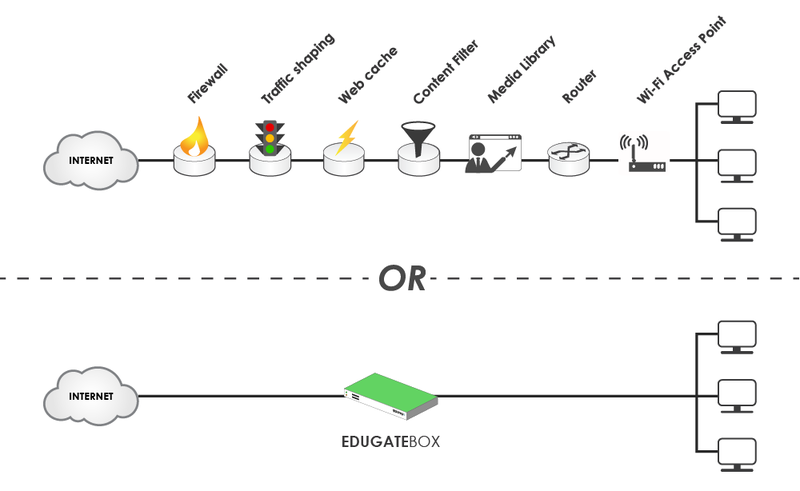 In choosing EDUGATEBOX authorities are not simply buying off-the-shelf. They’re benefiting from a carefully developed schools solution – designed to take the stress out of getting students online.